Thank you for helping create an alternative, independent journal and magazine, The GCAS Review. We invite you to submit poetry, prose, peer reviewed academic articles, commentary, video documentaries, and magazine articles. For peer reviewed academic articles should be formatted in Chicago Style, with hyperlinks where appropriate. The length can vary from 4,000 words to 9,000 words. All peer reviewed articles will be assessed in a double-blind manner. If an article is submitted by someone who has worked with GCAS or is a member of our community, they will be assessed by external readers outside the GCAS community. Turn-around for submitted peer-reviewed articles should be less than one month. All magazine articles will be assessed by The GCAS Review Commission for quality. If a member of The GCAS Review Commission submits an article that article will be assessed by another member of the community to ensure quality. 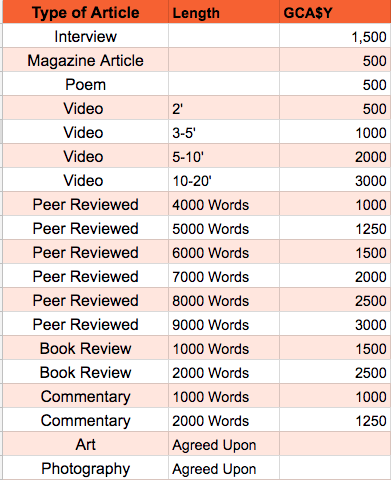 Turnaround for submitted Magazine Articles should be less than one week. Disclaimer: GCA$¥ tokens do not have any rights, uses, purposes, attributes, functionalities or features, express or implied, including, without limitation, any uses, purpose, attributes, functionalities or features within GCAS, and all granting of GCA$¥ is contingent upon approval from the GCAS Crypto Commission.